Should I consider brick paving for my new patio or walkway? The major benefits of pavers are their strength, durability and aesthetic appeal. Knowing all the facts will help make the decision process easier for you. How do bricks compare to concrete? Pavers are definitely stronger than concrete over the life of the installation. As years of snow, ice and traffic take their toll, concrete is bound to crack over time since it cannot expand nor contract. Repairs are noticeable with concrete. 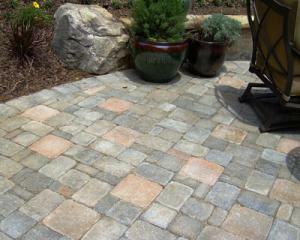 Pavers “breathe” during extreme temperature changes and should any paver become damaged, it can be easily replaced. No, not at all. They will require some cleaning and sealing occasionally to keep up their finish, colors and textures but it really becomes a personal preference. Poured concrete is less expensive but if the pavers are installed correctly the first time, your investment will pay off in the long run not to mention the immediate impact on visual appeal. How many brick choices are there? There are a plethora of styles, colors, sizes, textures and pattern options to fit your taste and style of living. Paver patios and walkways create beautiful outdoor living spaces and walkways add grandeur and functionality to any landscape. Whitehouse Landscaping is a ICPI Certified Concrete Paver Installer, a NCMA Certified Segmental Retaining Wall Installer and a EP Henry Authorized Hardscape Contractor.